← Ahoy there me matey! Where’s the pieces of eight? Rupert Bear was a children’s newspaper comic strip character created by English artist, Mary Tourtel. Rupert first appeared in the The Daily Express newspaper on 8th November 1920. His mission was to win sales from the rival newspapers of the time – The Daily Mail and The Daily Mirror. 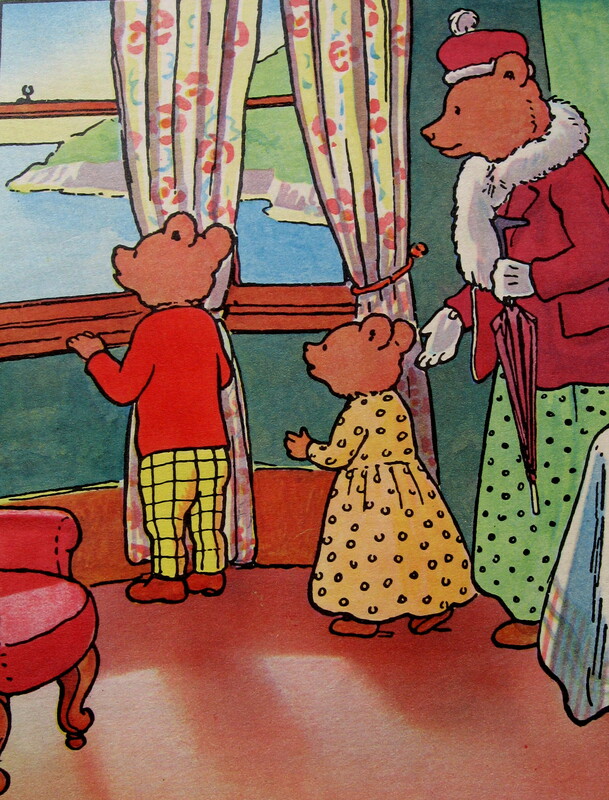 In 1935, Alfred Bestall, took over the illustrative and story content of Rupert Bear. Rupert, has become a well-known character in children’s culture in the UK, and his success has led to the creation of some TV series based on him. The above image is taken from Rupert at the Seaside, (1935), where Rupert and his family head off by train to Shrimpton Sands, including Aunt Emma and her little Joan. It is here that Rupert and Joan meet two boys Sam and Peter, who take them on adventures to Mermaid Cove. Not bad for a single bear who is 93 – all honey to you Rupert! This entry was posted in Illustrations, nostalgia and tagged #Children'sBooks, #Children'sLiterature, children's illustrations, Illustrations, Rupert Bear. Rupert at the Seaside. Bookmark the permalink.